The Schools are out for the summer. The kids don’t go back to school till the 1st week of Sept. This is the time for Play Dates, Sleepovers, spending time at the Beach or Pool etc. My grand daughter had a play date that turned into a sleepover. Next morning the girls were hungry and demanded waffles for breakfast. Checking the pantry I found that I had no AP Flour or enough milk. Instead I substituted whole wheat flour (Atta) for the AP flour and Blue Diamond Almond Milk for regular milk. The result was awesome!! Mix the 1st 4 dry ingredients in a bowl. Keep aside. Meanwhile heat the waffle maker. In a separate bowl, lightly beat the eggs, add the remaining wet ingredients and beat together till combined. Now add the dry ingredients to the wet ones and mix well. 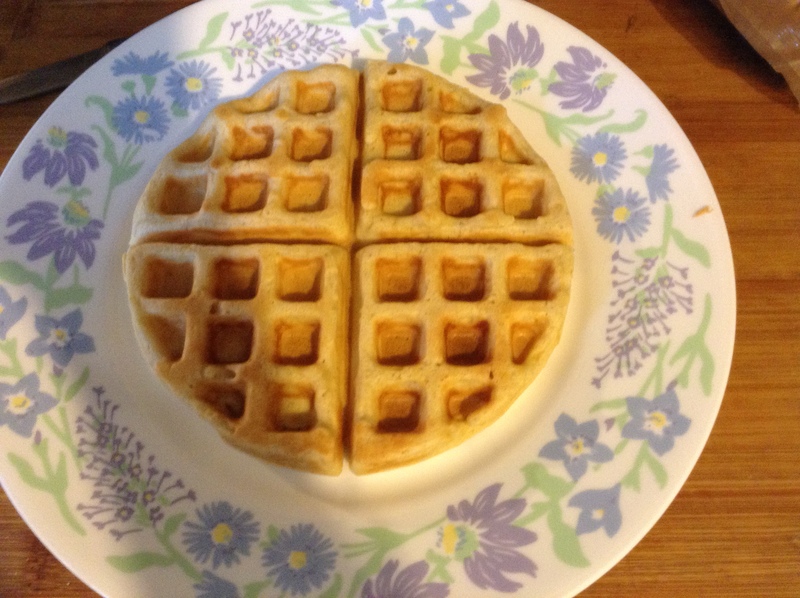 When the waffle maker is ready, pour a ladle of the waffle dough on to the waffle iron. Let it cook till done. Serve hot with syrup, butter, fruit couli or a bacon cheese sauce. Makes 4 large round waffles. Full of fiber and wholesome goodness, yum! This entry was posted in Almond Breeze, sugar, Vanilla extract, Whole wheat flour (Atta) and tagged Waffles. Bookmark the permalink.